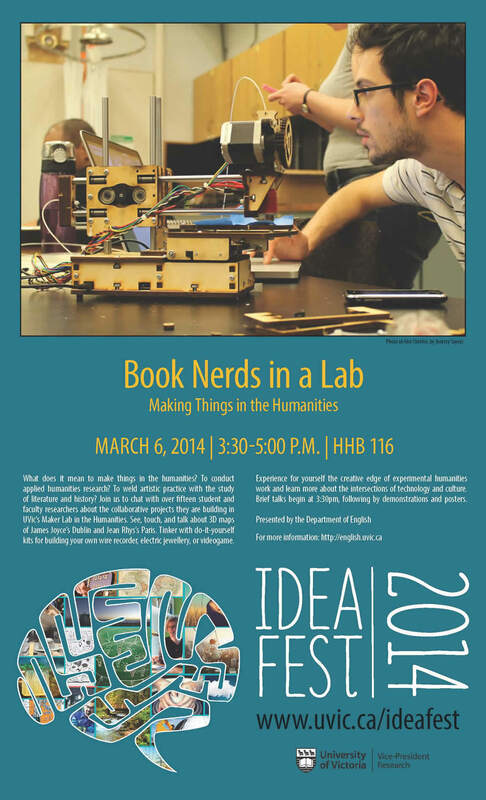 This week, on Thursday, March 6th (3:30-5:00pm, in Hickman 116), members of the Maker Lab’s MVP, INKE, and Kits for Cultural History teams will be presenting their ongoing work during IdeaFest at the University of Victoria. Our presentation will include a talk as well as demonstrations, with an emphasis on making visible the workflows, methods, and everyday practice of our research. Below is a general announcement and poster for the event, together with a brief description of what we’ll be doing between 3:30 and 5:00pm in the Harry Hickman Building. We hope you can join us! In the meantime, get in touch with any questions about the event. “Hello World! Building an LED Circuit” (with Nina Belojevic and Katie McQueston): Work with researchers from the Kits for Cultural History project to not only build a simple LED circuit but also learn more about the legacies of “wearable technologies.” During this demonstration, we’ll provide participants with the materials they need to make a simple circuit and explore wearables. “Warping Historical Maps” (with Adèle Barclay, Alex Christie, and Katie Tanigawa): With researchers from the MVP and INKE teams, learn more about how historical maps can be digitally manipulated to express literary representations of early 20th-century cities (including Dublin and Paris). Also learn more about how 3D modelling software is being integrated into humanities research. “Making Analog Audio” (with Laura Dosky, Jon Johnson, and Zaqir Virani): Ever wonder how sound was recorded before the emergence of digital technologies? With members of the Kits for Cultural History team, see how early magnetic recording and sound transduction worked by constructing a low-tech recording device using everyday materials. “Remaking Ulysses with Twitter” (with Stefan Krecsy and Jentery Sayers): For scholars of literature and language, Twitter is increasingly becoming a research tool. During this demonstration, learn more about the MVP’s “Year of Ulysses” project, its use of Twitter to facilitate public discussions of the novel, and several ways to gather and express Twitter data. Post by Jentery Sayers, attached to the KitsForCulture, YearOfUly, and ZAxis categories, with the news tag. Poster for the event care of the University of Victoria.